Microsoft seems to be at the center of all the rumors right now in a way normally reserved for Apple. Aside form the mystery media event in Los Angeles later today, where Microsoft is expected to make a tablet-related announcement of some sort; it’s also the focus of speculation that it is finalizing talks to acquire Yammer for around $1 billion. 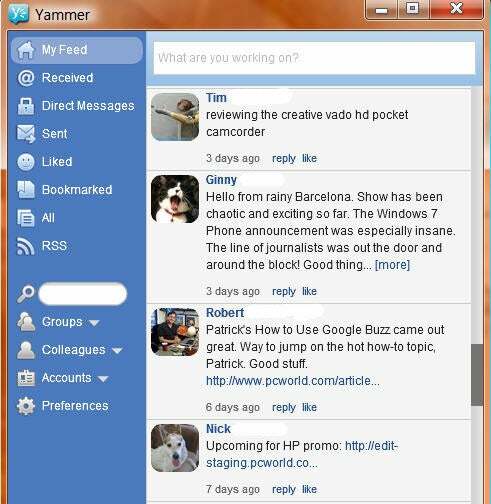 Yammer is a social network with a twist. It’s a private social network intended for business use. Yammer is like Facebook, but a Facebook that’s segregated from the rest of the Internet, and that provides monitoring and controls for IT admins to be able to enforce policies and protect information. SharePoint is a great platform, but it needs capabilities like Yammer to keep up with rivals. So, what’s in it for Microsoft? A billion dollars may not mean as much to Microsoft as it does to Facebook, but there still has to be a valid underlying reason to spend that kind of money. The answer seems to point to SharePoint. Integrating a private social network like Yammer with SharePoint would give Microsoft a much more robust platform for collaboration, and allow Microsoft to compete on more even footing with rivals like Salesforce with its Chatter social network. Yammer also has apps available already for Windows Phone, Android, iOS, and BlackBerry mobile devices, as well as a standalone app for both Windows and Mac. Yammer is like having a private Facebook just for your company. Enderle notes that acquiring a company like Yammer is more about the people than the product. The technology is good, but what Microsoft really needs is the unique skill sets of the people who envisioned and developed the platform to help integrate it with Microsoft software and continue to evolve its capabilities. Retaining key employees after an acquisition hasn’t been easy for Microsoft. However, Enderle stresses that Microsoft will need to figure out how to keep the Yammer talent on board in order for an acquisition to meet long term expectations. SharePoint is a great platform with a solid customer base, but without features and capabilities like a Yammer acquisition would bring to the table it runs the risk of stagnating. Yammer would be a wise investment, and if Microsoft executes properly it shouldn’t have any problem getting a billion dollars of value from the deal.